We know how important the perfect bedside table is as to its usefulness and so in responding to that, we've put together the ultimate bedside table buying guide in order to assist you in finding the best bedside table for your home. A bedside table is used for a variety of reasons, allowing extra storage for clothes and underwear, a place to put your alarm clock, mobile phone, jewellery or even a table lamp. When deciding what type of bedside table to purchase there are some important points to consider: what you'll use the bedside table for, choosing the best style and design and much more. We have highlighted these below in our bedside table buying guide for you to explore. What will you be using the bedside table for? Are you looking for somewhere just to place your alarm clock, or bedside lamp, perhaps you wish just to lay spare change or somewhere to place your watch when you are asleep, well then a nightstand or bedside table will do the trick. However if you are looking to store more items, many of which you dont wish to be on display, like a remote control for the tv, your mobile telephone, underwear or paperwork well then you should look at better storage options usually available with a bedside chest or bedside cabinet, both have plenty or storage and allow you to de-clutter your bedroom even more! Choosing a bedside table style and design. In many bedrooms, bedside tables can be used as the bedroom's focal point, therefore style and design are critical. Firstly, you must make sure the bedside table matches the bedroom décor. Ask yourself the question: Am I looking to decorate my bedroom in a traditional or contemporary style? Do I want my table to be made out of wood, metal or glass? Traditional styled bedside tables are generally wooden painted bedside tables, sometimes carved with attractive detailing and clean lines giving a period look. Perhaps contemporary is more your style, well then why not make a bold statement with vibrant colours. High gloss bedsides (usually available in bright colours) and mirrored bedside tables are very popular with interior designers and luxury hotels and will beautifully contrast with your bedroom furniture. For spare bedrooms, tenants and landlords, simplicity and practicality could be your objective (that you need extra storage, or somewhere to put an alarm clock) well then search for a plain bedside table or bedside chest, both basic and inoffensive, designed to match all bedroom interiors. How wide should the nightstand be? This can be a stumbling point for many people searching for a bedside table. These days with more and more housing needed, bedrooms seem to be getting smaller and smaller, especially in town centres. The double bedroom is no longer a proper double (hence the need for small double beds) and can cause a real lack of space for bedroom furniture such as bedside tables. Will it comfortably fit by the side of your bed? Does your bed have drawers and will these drawers still open with a bedside next to it? Will the bedroom look cluttered with two bedside tables or is it better to just have one so as not to take up too much space? If space is of no concern to you and you have a large bedroom then perhaps contemporary wide bedside tables will be better suited so as to give the feeling that your bedroom is not so empty looking. What is the ideal bedside table height? The ideal bedside table height should level out at the same height as the mattress comes up to upon your bed. The best bedside table height should be at equal height with the mattress, in order to ensure that both placing and removing items off the table is easily done - even whilst laying down in bed. If the bedside table is too small, or too high, it can make accessing those late-night grabs a bit tricky. 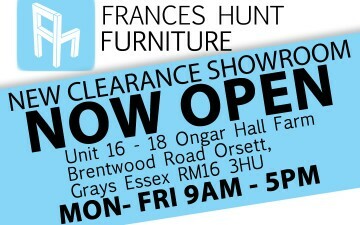 View Frances Hunt bedside tables.